The original idea and design are by Manuela Unterberger (IKS, TU Graz). There are several versions which are explained below. Easy version: Print out this model on an A1 paper. You will get a mobile with nearly original size. Printed on A3 paper it will be a 1:2 model; and on an A4 paper it will be a 1:3 model. Cut it out, stick the planes together to get a 3D model that you can use as decoration! Click to download the pdf file for the mobile here. Advanced version: Print out this model on three A3 pages, cut them out and stick them together on the appropriate edges. You will get a 1:1 model of the BRITE-Austria / TUG-Sat 1 or the UniBRITE satellite. Click to download the pdf file for BRITE-Austria satellite here. 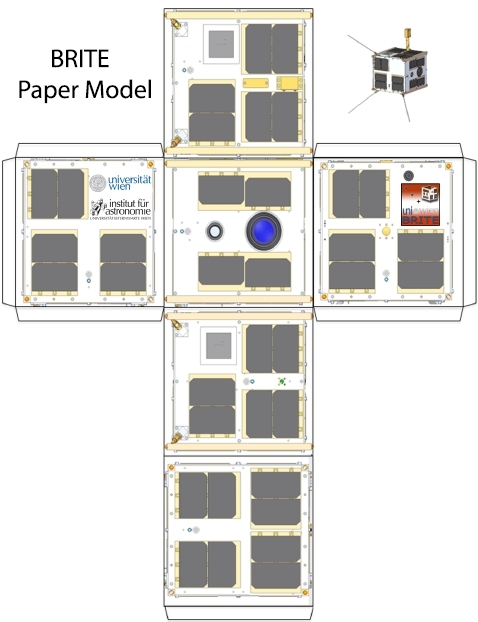 Click to download the pdf file for the UniBRITE satellite here. 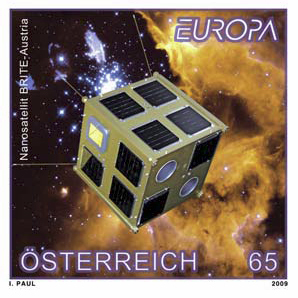 Presentation of the official Austrian stamp “Europa 2009” which shows one of the BRITE satellites on June 5, 2009.